Sorry for the sideways photo. Click on it to see more detail. 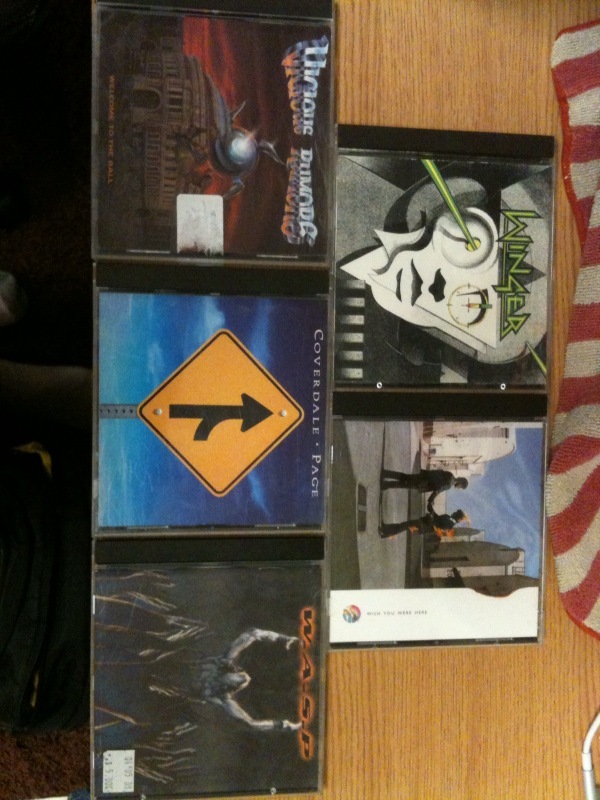 My first visit to a pawn shop was filled with treasures galore, all CDs for a measly $3.00 each. I was super stoked to find a small collection of metal, especially Vicious Rumor's Welcome to the Ball, as I've been meaning to get into them for a very long time. 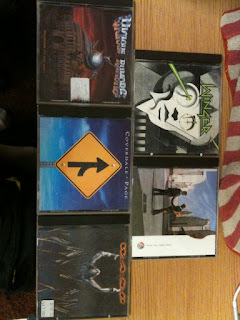 The rest of the albums were icing on the cake because all five have little to no scratches and play perfectly. There are a couple Alice Cooper albums that I may decide to grab come Monday, but, for now, I'll be rocking out to these five, especially Vicious Rumors. I wasn't really sure about getting Winger's debut because I don't find them that great of a band, but for three bones, why the heck not? I still love Coverdale-Page to this day and, despite the hair metal lumpings-in, think the first two Winger albums are fantastic (as well as the first two Slaughter albums, for that matter). Kip Winger added backing vocals to Alice Cooper's latest but, sadly, no guitar. I have to admit that my first listen through of Winger's debut has me reevaluating my stance on the band. The pawn shop has Winger's second record as well, and I may grab it if it's as good as you say it is, Gogmagog.